El Cheapo crew did an excellent job with a large tree that needed to be trimmed upward and have some dead branches removed. As they were doing the job branches were promptly removed - a clean job indeed. Also, they are reliable and on time. They told me they would be there at a specific time and they did keeping me informed as they were on their way. Last but not least, they lived up to their name (El Cheapo) - their price is competitive for a job very well done. Will book them again and we recommend them. I have Ed do several projects for me. Every time he has shown up when he said he would... and do the job better than expected. He has always met or exceeded my expectations...and for the price that he quoted or agreed to do it for. I cannot say enough about his character, his company and his workmanship. I would highly recommend Ed for any arborist project that you need done right. He’s the only one that I will use for any arborist or tree work. A couple of the projects he has the job completed before I get other quotes and they always come in higher than his price any way. He’s the best value and does the best work! Congratulations Ed for putting together such a successful team !! El Cheapo Tree Service has always done great work. They are fast, do excellent work and clean up very well. The crew is always courteous and friendly, as well as professional. Not only were we, the customers, impressed by the quality of El Cheapo's work in removing a huge old tree from our yard, half the neighborhood also turned out to watch the process. Everything went smoothly and quickly, on a street where there was not a lot of room to work. Well done! I called about 10 tree removal companies and my last call was to El Cheapo. Not only was their price the lowest but they showed up on time and all were professional workers. From start to finish they did the job so efficiently. When they were done they cleaned up the yard and the street. Hats off to the whole team. I recommend El Cheapo to anybody looking for tree service or tree removal. I got goosies watching the teamwork it took to remove a 45' tree today. I can't say enough about how professional and efficient a job that Ed and his team. Pics and videos to be posted later. 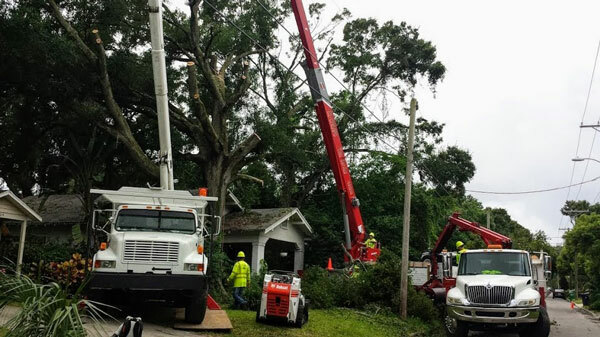 If you need tree service or know someone, PLEASE call them and give them an opportunity to earn your business. You will be happy you did. Ed and his crew did an outstanding job removing 3 very large (dying) trees from my property. They worked seamlessly together and performed the job in less than one day and to my satisfaction. Their equipment is top notch and in excellent shape.This is the second time I have had El Cheapo Tree Service at my house and I would not think about using any other service the next time I need some tree work done. I've never experienced the level of professionalism and courtesy from a business in the genre of El Cheapo Tree Services.Ed made the process painless. The workers were courteous and professional. The work was "Top Notch". AND he was less expensive than the competition.Ed took the time to educate us on the condition of our trees and expressed interest in service after the sale. He went the extra mile to get the permits and communicate with the electric company regarding power-line issues.El Cheapo is the BEST! 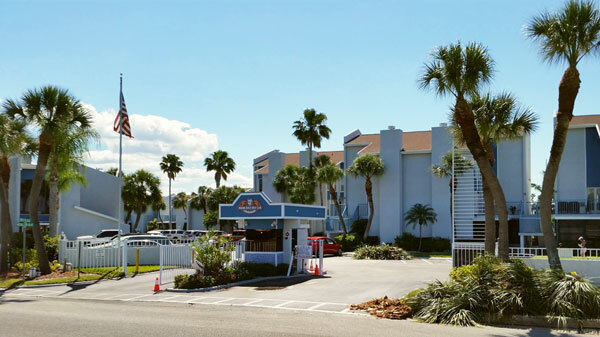 Ed and his crew were extremely efficient, communicative and professional. If it wasn't for the missing trees from my yard, I would have never known that they were here. Ed was friendly and flexible to work around my work schedule not only for the estimate but also the work being performed. They have done multiple jobs in our neighborhood with everyone pleased with the results, now we are added to that list. I will definitely be calling them back for any future work. Outstanding job. Ed and his crew came highly recommended. I hired them and they did exactly what i wanted and the price was on point. I will be hiring them for my next tree trimming project. Happy customer. We have no hesitation to highly recommend Ed and his crew. They are professional, timely and skilled. They went above and beyond the specified job without hesitation! Highly recommend 5 stars !!! We had a massive Norfolk Island Pine that was leaning heavily and clearly needed removal. El Cheapo gave us a very fair price, prompt service, and the confidence they could handle it. 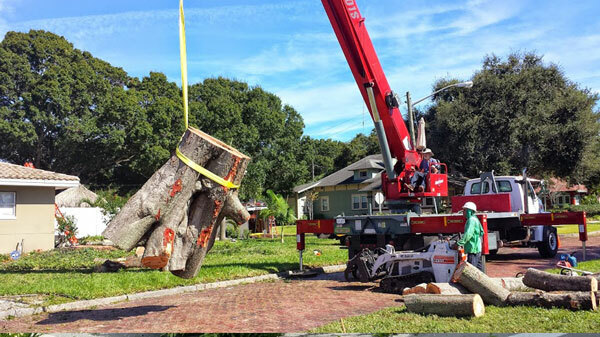 It takes guts to take down a 100 ft tree, and after watching them remove it, we were even more impressed. The entire team was hard-working, knowledgeable, and very pleasant. When they were done, you couldn't even tell a tree once stood there. Job well done! We were beyond pleased with El Cheapo’s work! First of all, I called several different companies, and they were the only ones that responded right away, and then gave us a great price considering all the work that needed to be done. Ed was extremely easy to deal with and has an awesome team that works for him. Victor led the job while they were here and he and the rest of the team went above and beyond! They left my yard cleaner than when they showed up. I HIGHLY recommend this company! El Cheapo came out and trimmed, pruned, & raised the canopy on 3 trees on my property. They were very professional & did an excellent job. Their equipment is top notch & they have everything needed to do the job right. After doing everything to my satifaction, they cleaned everything up & hauled it away, raking & blowing all sidewalks & driveway. They are by far, the best tree service I’ve ever dealt with & their price is very fair. If you want a good price for a great job, call El Cheapo ! I have used El Cheapo for 2 different jobs. Awesome company . Quick response time for both jobs. Great communication. They do a great job and are reasonably priced. HIGHLY RECOMMEND. 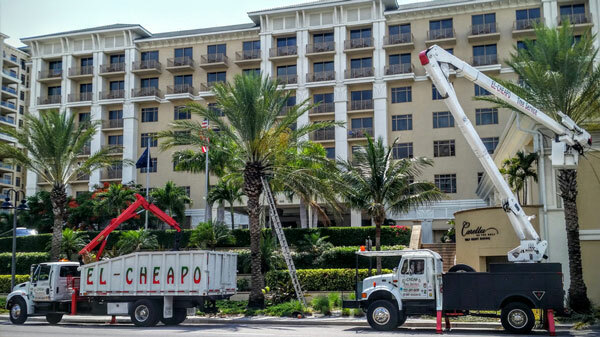 We continue to hire El Cheapo for all our tree service needs. Their professionalism and good work keeps us calling. Recently, we needed surrounding growth cut back away from our home and three palm trees trimmed up. Ed and his team did another top notch job! 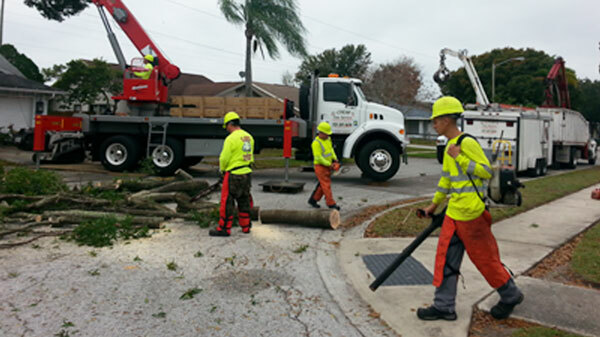 If you are looking for a tree service team then look no further, you found the best! Ed and his team did an excellent job at a reasonable price! They rid my yard of years of overgrowth of bamboo! They worked with me on timing to get stumps ground so a new fence could be put up so my dogs wouldn’t be left w/ o a fenced yard for days. Thanks for a job well done! The El-Cheapo Tree Service team did an amazing job for us. We had several trees and shrubs that needed removed. The crew arrived onsite, focused on the task at hand, and were finished in a matter of minutes. Prompt, efficient, thorough, and CLEAN! !We highly recommend them for any job you need done!! El Cheapo is hands down the BEST tree service. They are licensed and insured. They are extremely professional and friendly. Safety first with this crew. I had an extremely large oak tree that had to be removed and an equally large mango tree that needed trimming. They were "early"....not on time, early! The crew got straight to work. Other then the naked sky, you can't even tell that they were here. Every inch of debris was cleaned up and zero damage to the lawn. I will recommend this company to everyone!! Thank you El Cheapo. Your name doesn't do you justice. 10/5/2018El Cheapo just left our 42 unit townhome community where they systematically took down two 30 year-old Grand Oak Trees. It was fascinating to watch them work - so efficiently- all highly professional crew members interacting as an amazingly well choreographed team, directed by Ed DePaul, ISA Certified Arborist. It was easy to observe that respect for the surrounding environment and safety of self and fellow workers was paramount in their energetic work ethic. These Oaks had outgrown their area and were located in a very confined small patio area, bounded by a stucco wall. Their expertise and skill levels were amazing. When their work was completed: they cleaned up all work areas/surfaces! put everything that had to be moved, back where it was !... and a little extra! Not only that, but their charge for this work was amazingly fair! Have used this company before and certainly will continue to call them. El Cheapo is El Amazing!!! 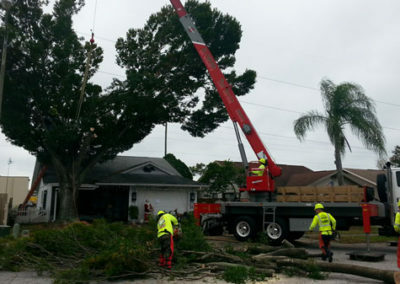 Patricia K.
A few weeks ago I had a couple very large trees cleaned out and I was extremely pleased with the results. I have had my trees cleaned before with other very well known, large outfits in this area but I will never utilize anyone else again. I was never happy with the results until I hired El Cheapo. Ed instructs his crew boss what he wants done and later comes out to inspect how they are doing, so between all the estimates he writes as well as making sure every job is done to his satisfaction, he is very busy but I can guarantee you will not find better results from another company. His crew is professional and hard working and I enjoyed watching their teamwork.I can always tell a good outfit by the tools and equipment they have and this company has the best, allowing the crew to perform any job safely and efficiently. They also cleaned up my property completely from all debris. Exceptional service. Very professional. Safe. These guys do a fantastik job! They even cleaned everything up! NOTHING left behind to have to rake up! They will be my only call for any future trimming of our trees here! Ed and his team are the best! We had 2 trees and several shrubs removed and other pruning and trimming done at our home. Ed and his crew showed up as promised, completed the job quickly, and left our property thoroughly clean. All this at a great price. I highly recommend this company! This company has come a long way since they first managed my extremely large Live Oak, some 20 years ago. Their arborist is very knowledgeable and put my mind at ease, regarding an issue that I thought would comprise my oak, property and house. He did a thorough inspection, explained exactly what was happening with the tree, and exactly how their crew would take care of the issue. The crew, well, in my opinion, the best! I've had multiple "local, well regarded tree services" manage my Live Oak throughout the past two decades. Never has anyone of them, been more honest and courteous, than "El Cheapo". High quality work, at an affordable cost. Don't confuse their catchy name with their excellent service. Thanks again, guys. I'll be soley calling you back, from now on! Just had El Cheapo remove 3 very large trees. I was amazed with this company and it's employees. They came in tied for the lowest price I was able to get from anyone else for 2 trees and they took out 3 for the same price! The equipment was in the best condition I have seen. The crew has obviously worked together for a long time, The supervisor Monty had his eye on everything and didn't even have to tell his crew what to do verbally. Mostly whistle and hand signals. Military like. These guys really care. I have used many other tree services over the last 26 years and I will never use anyone else but El Cheapo going forward. I don't do a lot of reviews because I don't find many companies that deserve high praise, but these guys sure do. 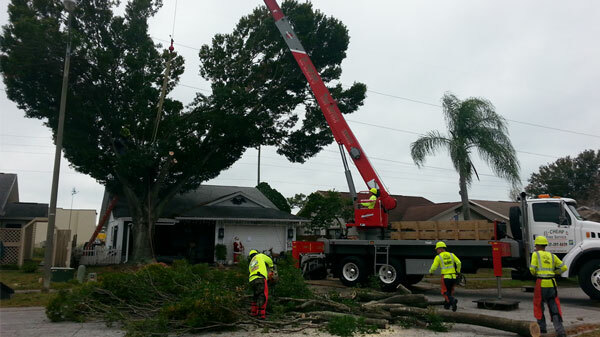 I have used El cheapo tree service on several occasions now and will continue to do so. They are professional, reasonable and quick. They recently took down several trees and trimmed two palms and we're in and out in less that 2 hours, including cleaning up all debris. I would highly recommend them for any work you need done. If anyone is looking for a tree service I seriously doubt you could find a better one. Their El Cheapo name only reflects the cost to you, not the quality of their work. There's nothing cheap about their standards. They're very professional, their efficiency is amazing! Quality equipment, high safety measures for their workers and your property, good communications, everything is top notch! If I ever need more work done I wouldn't use anyone else. Thanks to all members of the company. El Cheapo Rocks! These guys worked well and efficiently together. 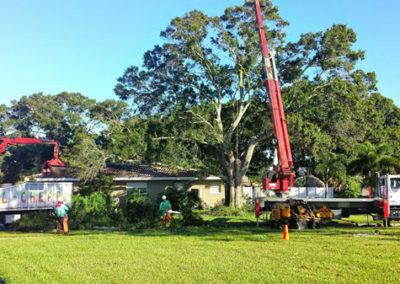 From Ed to Monty and the whole crew it was thrilling to watch them remove a huge live oak tree from my backyard between two houses. They love their job and it shows from saying hello, communicating to each other and nicely cleaned up after themselves. They are 5+ rating company and worth 10/10 for customer satisfaction. We've been using El Cheapo for years. They came out yesterday to remove a couple of trees and trim quite a few. The guys were very professional and efficient. Everything was cleaned up. Their prices are good. We wouldn't go with anyone else. Ed did a wonderful job of assessing the trees, just very professional and on top of things. We hired El Cheapo about a month ago to remove our bamboo and paradise palms. They came out very quickly and were very efficient. All and all they did a great job. They even went above and beyond by blowing off my front porch( not affected by their work) and spreading a mound of dirt left behind after I removed my planter box( all without charging extra). Their price was reasonable and office staff was friendly. Unfortunately, recently my bamboo came back as there seemed to still be some root system left. I called Ed with El Cheapo and explained what had happened and they sent somebody out the next day to take care of it( free of charge). Ed trimmed my live oaks, my palms, and my mangroves. He always does a great job at a fair price. I don't have to supervise his crew because they know what they are doing. It's true, Ed has a backlog due to the high demand for his service. I've always found it was well worth the wait, both in price and quality. Thanks Ed! Professional and courteous service with terrific attention to detail from start to finish. This firm carries general liability and workers compensation coverage - important factors for our decision. The work was well done. Plus we were made to feel like valuable customers. We've already recommended this company to others! Thank you to Ed and his crew from El Cheapo Tree Service. The long term project started in November 2005 to thin out and trim down the mangroves to a manageable height directly behind the Building which is located on the water. 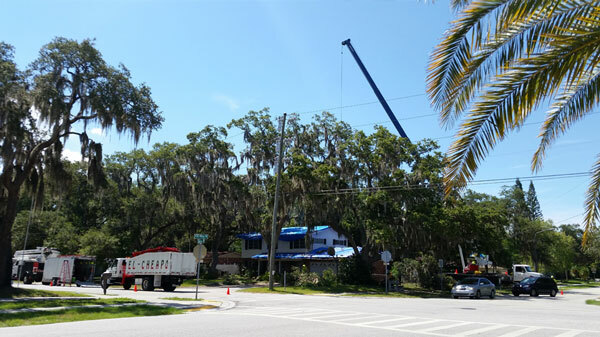 Our owners are committed to improving the property and view while respecting the needs of the wildlife and regulation set forth by Pinellas County which prompted us to hire A El Cheapo Tree Service. Following the yearly cutting limits A El Cheapo was able to achieve water views for our first floor owners. The crew also removed the cuttings which has increased the activities of the Egrets, Herons, Ibis and other water birds. A great job accomplished while staying on our limited budget. El Cheapo did a fantastic job! I shopped for the best price and El Cheapo ended up being the best price along with the best service/most knowledge. When he came to give an estimate he taught us what he was planning on doing and why. He told us what needed to be done not what we wanted to hear. We had a tree we originally wanted trimmed but after El Cheapo took a look he informed us that it needed to be removed because of safety concerns. I greatly appreciated his honesty and concern for the safety of my family. Multiple other companies told us at first they could trim the tree but when we asked if it should be removed for safety purposes, they said if it were their tree they would have it removed. I don't like the fact these other companies were not honest up front about safety concerns related to this tree. Once the crew arrived they were professional and ready to work. We had more done than what we paid for and that is because El Cheapo puts the costumers safety and the quality of his work above all. El Cheapo came out with a crew that was well prepared and has all the proper equipment needed. Thank you El Cheapo for taking care of my family and I.
WOW! Can’t say enough about Ed and his El-Cheapo crew. Ed is incredibly friendly, highly knowledgeable and thorough. He called to let us know when to expect his crew and followed up before they drove off. His two-man crew were polite and efficient. They showed up with BIG equipment, walked the job and understood what needed to be done. It took them ONLY a half hour to trim a Maple tree, remove 2 small fan palms, 2 huge fan palms with a small cluster of palms, grind the stumps, haul and clean-up. They even raked, covered holes and blew off sidewalk. Amazing Job! We HIGHLY recommend El-Cheapo and will call on them again. They’re Affordable - Dependable - and Professional. Best service ever! AMAZING SERVICE! From the quote to completion, El Cheapo was a pleasure to work with. Quoted a good price to remove a large oak from our back yard. Came when they said they would with an "army" of professionals and a fleet of equipment. In 2-1/2 hours tree was gone. They cleaned our yard, roof, driveway, street and neighbor's yard better than before they came. If you call any others your wasting your time. I wish I could rate them higher, they are truly professional is every meaning of the word. This job started originally by another company whom should never trim another tree and El Cheapo came in and saved the day. I cannot rave enough they were outstanding and their prices are reasonable. 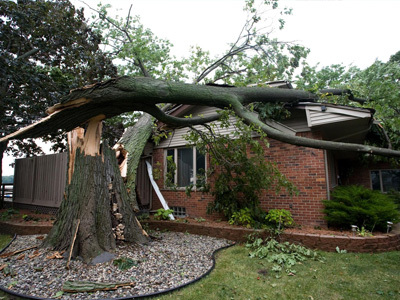 More important is that they know how to trim trees without creating damage or future problems. they are wonderful. I would not hesitate to hire them again or recommend them. Don't let the name fool you. Hire them. You will not regret it. El Cheapo Tree Service is terrific! From the time of our request for an estimate to the time of completion was a week. Ed stayed in contact with us and was very quick in responding to our requests. 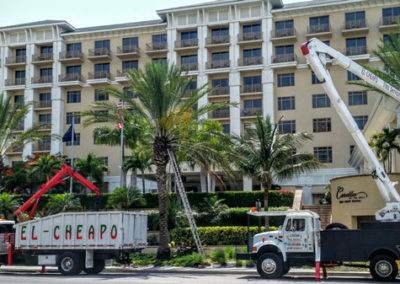 We would recommend El Cheapo to anyone seeking tree work at their residence. The only thing "cheapo" about "El Cheapo" is the reasonable price. The service is topnotch. Ed, who is as customer-oriented as he knowledgeable, had his crew do some tree work for us. They worked quickly and efficiently and went above and beyond. I would highly recommend this company to anyone looking for a professional quality job done in a timely manner. El Cheapo Tree Service did an outstanding job. Supervisor and crew were very professional and punctual. We had them remove and trim some trees including a huge mango tree, now it looks so much better. We definitely would recommend this company to do any type of tree trimming or removal. The price was very reasonable too. 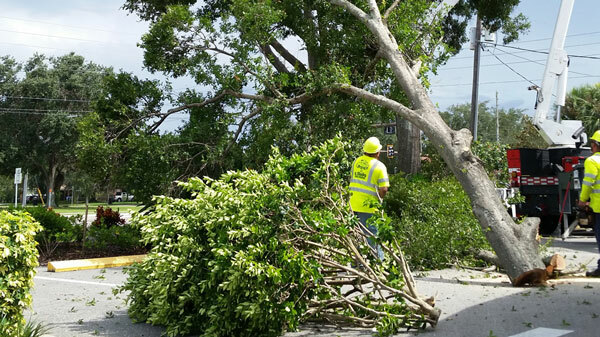 We had a grand-sized Avocado tree and some other trees that were located in the utility lines removed. El Cheapo was professional from start (quote process) to the end (clean-up). They took less than two hours and the crew was happy and professional. You could tell this crew loved their job, and they worked great together as a team.Thank you El Cheapo Team, and thank you Ed for your professionalism and great service. I highly recommend this company! I can't say enough good things about Ed and his company. His honesty, followup and quality of work is outstanding. His crew was very professional, observing all the appropriate safety precautions. Ed was onsite for the job, and his crew did a phenomenal job with trimming and removing trees as well as cleaning up after the job. Definitely would recommend and have already done so to several people. El Cheapo crew started this morning and systematically disassembled my tree in a peofessional,compact and tidy manner. Clean up was perfect with attention to detail, hard to tell they were even here other than the tree is gone. Thanks Ed and crew! I would highly recommend these guys. I would recommend El-Cheapo tree service for your tree service. From the time Ed DePaul gave us the estimate till the job was done everything was very professional. We were really impressed with the speed of the job, the quality of the work and the attentiveness to our needs. The attention to safety was really impressive. You can tell the crew is well trained. They worked together amazingly. They even replanted our shrubs. After they left the only way you could tell they were here is that the trees were missing. If you have trees that need work I recommend that you give El-Cheapo a try. Even our neighbors were impressed. Top notch, professional tree service from the first call, all the way thru until the job was completed. Ed provided a quick and affordable estimate for tree trimming of an Oak in our backyard. When the crew showed up on site, they were clean, courteous, and "ready to work." Their equipment was also clean and well maintained. I would highly recommend this company for any of your Tree Services needs. We had a extremely large tree that was hanging over 1/3 of our house that was damaged during the hurricane. After several quotes, went with El Cheapo as we had several friends that had used them over the years. They did an absolutly amazing job. 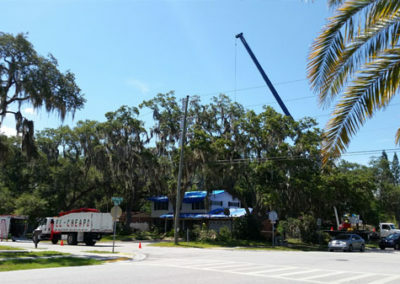 They had their own crane and bucket truck and removed the tree from over the roof in half a day without a hitch. Ed and his crew were very professional and courteous. They took care of the permit and everything and cleaned up the whole area when done. We could not have been happier with the entire process. Thank you Ed De Paul and your entire El Cheapo crew! We were thrilled with your professionalism from start to finish. Monty, your crew chief, was extremely polite, respectful and hard working. Your company is impressive with state of the art equipment and a top notch crew that works well together to get the job done in a timely manner. 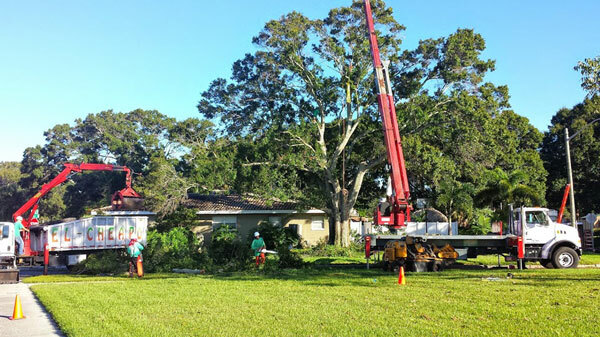 We would highly recommend you to anyone needing expert tree service and the knowledge of a caring, certified arborist. Ed and his guys were fantastic! They had a ton of work to do on one of the hottest days and were very professional and pleasant while completing this big job. 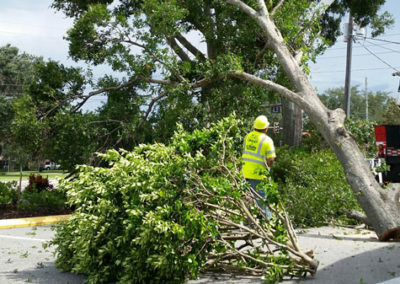 They took down an oak, elm, 3 palms and an avocado tree. They ground up all the stumps and trimmed 2 oaks as well. We received estimates from 3 companies and Ed's came in far less than his competitors. They did a great job cleaning up and even took away our piles of tree debris that sat on our curb from Hurricane Irma (we were glad to see that leave our front yard as well). great customer service from Ed and his brother Monty. Their crew did a quick and thorough job taking a tree down for us. We highly recommend them. We wanted to hire a professional arborist and after talking to 5 tree companies for bids we decided to go with El Cheapo because our huge oak tree deserved a real arborist and after talking with Ed we know he was the real deal! 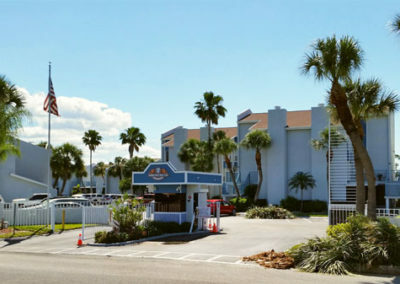 All of Ed's crew were professional, helpful and knowledgeable. They followed through on every request. We couldn't be happier with the tree trimming results!!! Ed and his team with El Cheapo did an excellent job on my oak trees. Ed took the time to explain the process thoroughly to me and from start to finish they completed the project efficiently as well as leaving my property cleaner than when they arrived. Very professional group and would highly recommend them to anyone! Second time using them. As always, reasonably priced. 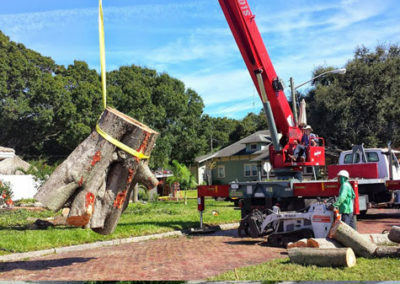 They cut down a huge live oak using a crane. They were very cautious with my landscaping. My property was cleaner after they finished. They did a great job and I would highly recommend. Thanks Ed! Ed was a pleasure to work with--he listened to what I wanted and delivered in a professional manner. He was courteous and his crew left my place looking clean. When I saw the results, I kept saying "wow!" So happy. 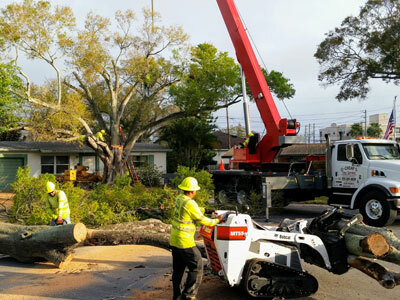 We needed a very large live oak tree removed because it was right up against our house. They handled everything from the permit to cleaning up after themselves and were polite, friendly and a pleasure to work with. And their price was the best of 3 bids we had. We found them because they did work for our neighbor. They did the same great job for him. I strongly recommend them. It was a pleasure working with Ed to set up the job and see it to its completion. Very satisfied with the work performed and the crew on site. Work was dependent upon permit issuance, but once issued work was completed right away. Everything hauled away such that look like they were never here. Would use them again! I highly recommend. Ed was fantastic to work with. On time, great job and very reasonably priced. I will use Ed for all my tree needs going forward! 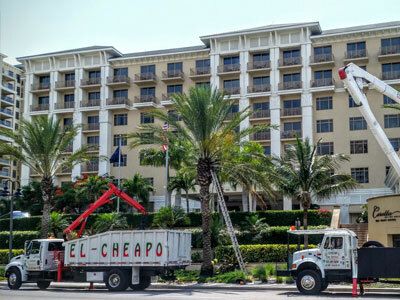 I called El Cheapo because I liked the name, but the service that Ed and his team supplied was much more than an affordable tree service. I just had solar panels installed on my roof. The solar guys said my sycamore needed trimmed back to allow more solar exposure to my panels. I was more than a little nervous but called Ed at El Cheapo. He assured me that he knew exactly what needed to be done. When Ed and his team arrived, my panels were bringing in 3000ws. A half an hour later when Ed and his team were done, my panels were pulling in 4500ws and my sycamore looked beautiful. I am thrilled with the results that Ed and the El Cheapo Team were able to achieve! Thanks guys! I can't begin to say enough wonderful things about this company. Ed Depaul,the owner is so personable and helpful and answers all your questions. He came out and evaluated the tree and gave me a fair quote. His staff is so professional and also very friendly and personable. I had a large Laurel Oak in my front yard that need to be removed. Seven guys came with the cranes and all their equipment, I was so impressed. 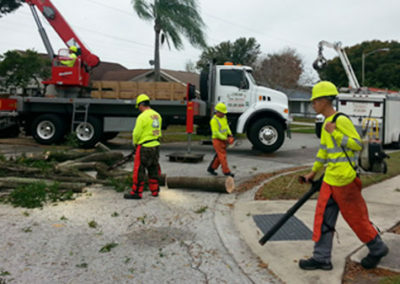 This team knows what they're doing and how to take a tree down safely and quickly. They arrived around 830, and by 1:30, entire tree was down, the stump was ground and everything was totally cleaned up. They didn't leave any mess behind. I'm very particular, and when I paid to have something done I expect to have it done right. They did an awesome job, I would definitely use them again, and I highly recommend them to anybody. Great job guys!! I can't say enough good things about these folks. They worked with me on price to save my family money. They were fast and efficient. In and out of here in under three hours with a 40 ft slash pine right on the corner of the house. It is wonderful to find people providing services with a smile and a handshake. Believe me, you won't find a better deal out there, as they came in 800$'s cheaper than any other company. They treated me like a neighbor instead of a customer! Great job Fellas !!!!!! Excellent work for a great price! Very professional with state-of-the-art equipment. 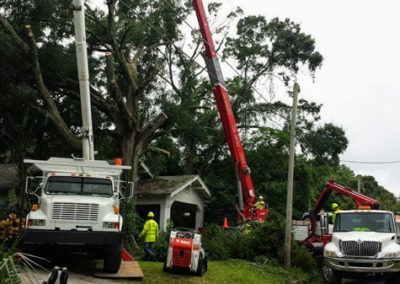 They took down a 30' to 40' Slash Pine, removed two dead trees, trimmed up a huge Bay tree and the Oak in the front yard. All in under 5 hours. They even did the stump grinding for no additional cost. I can now see my yard and I love it! I highly recommend El Cheapo for any tree work that you need done.